Please contact us with full details of your desired car(s), including preferred maker, model, colour, condition, mileage etc., and full contact details. Our English-speaking office staff will also be happy to assist you with selection of suitable cars. We will then provide you with a written cost and freight (C&F) invoice, detailing all expected car and shipping costs. Once we receive your approval of the C&F invoice, we require a deposit payment. Normally, this is 50% of the total cost and freight (C&F) invoice. We accept payment by telegraphic transfer (T/T remittance) only. 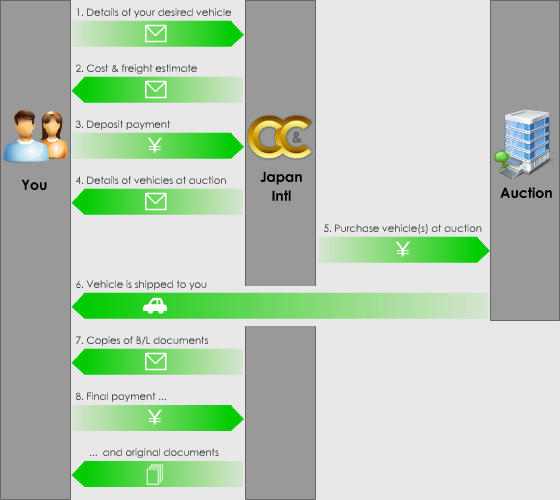 In the following days, we will search all car auctions for suitable cars to match your requirements. We source right-hand drive cars from Japanese car auctions nationwide, and left-hand drive cars from US car auctions (through our dedicated US office). Once we have found suitable cars coming up at auction, we will email you with full details about the condition of the car(s) and photos. Please note that some auctions in Japan do not provide photographs. With your approval, we will purchase your car(s) at auction, and take care of the transferral of ownership documents. We arrange transport from the auction house to the nearest suitable shipping port, and prepare loading documentation for overseas shipping. Once the car(s) has been shipped (either via container ship or RO-RO ferry), we will send you copies of the bill of lading (B/L) documents required for receipt of your car at your chosen port. The final stage is to make a final payment - normally this is the remaining 50% of the cost and freight (C&F) invoice. We accept payment by telegraphic transfer (T/T remittance) only. Upon confirmation of the final payment, we will send you the originals of the bill of lading (B/L) documents. Enjoy your quality new or used car(s)! If you have any other questions regarding our services or procedures, please don't hesitate to contact us.